"385", originally uploaded by Eric Jeschke. This fire hydrant fascinates me. I walk by it every day walking the dog in the neighborhood. I haven’t yet figured out how to make an image of it that conveys the special mood it evokes in me. It is so disheveled, rusted, painted on, swallowed by jungle…but it keeps on keeping on, like a trusty soldier at his post. You are likely to see some more attempts down the line here as I try to capture the “essence” of this hydrant. this reminds me of that movie about the robot that came alive…it’s after midnight, I’ve been looking at ALL your pictures and I can’t come up with the name but Amy would know…” the robot kept saying “#5’s Alive!” and Ally Sheedy was in it. It was very funny..the kids would like it. 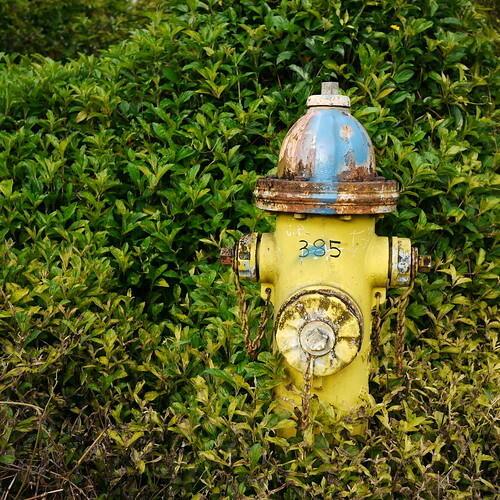 watch it and maybe you will get more ideas about the “essence” of your hydrant!